About a year ago I introduced you to the fiber art of Reiko Sudo and NUNO Corporation of Japan. 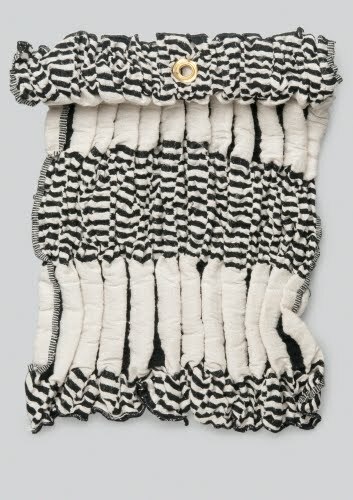 We currently have an exhibition in the Davis Art Gallery of a Japanese-born fiber artist, Mihoko Wakabayashi, who produces fabulous shibori (tie-dye) and Saori (unconventional weaving techniques) works, and it put me in mind of Sudo. Even more so because we acquired some new examples of her company’s awesome textiles from the Philadelphia Museum of Art and I just had to show them off! 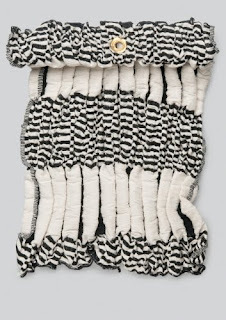 In 1984 Reiko Sudo and Jun’ichi Arai (born 1932) started NUNO Corporation, a company that produces textiles with an emphasis on unusual combinations of materials and techniques. The company was founded in order to produce textiles with traditional Japanese aesthetics in an eco-friendly manner. In 1987 she took over full leadership of the NUNO design team. Sudo’s designs artistry with the latest technological developments in Japanese industry. The preferred materials at NUNO are silk, polyester, cotton, nylon tape, and hand-made paper. One of Sudo’s earliest personal experiments in novel materials was the exploration of a variety of ways of using plastic. To reduce the company’s ecological footprint, NUNO always uses leftover scraps of materials in unusual combinations to produce new textiles. Many of the technologies used by NUNO are adapted from Japan’s traditional “crafts” culture involving, but not restricted to, salt shrinking; mud-dyeing; rust-dyeing; caustic burning; fatiguing by hand, chemicals, or machine; and graffiti decoration. Nuno means “cloth” in Japanese. The materials produced by Sudo and NUNO are not mass-produced, but combine hand-manipulation with industrial milling that keeps costs low. The fabrics can serve a variety of uses, from clothing to interior design. 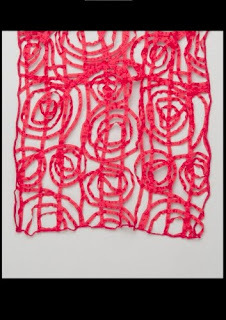 From what I understand, this chemical lace process is basically the weaving of the nylon tape onto a water soluble base material with a pattern (such as corn starch paper?). This leaves only the lace when the base is washed away. 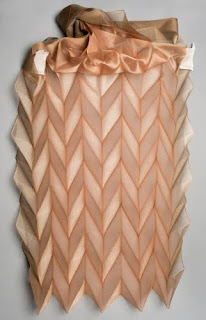 This beautiful pattern is hand-pleated! 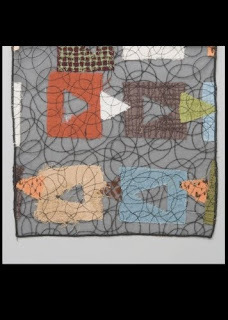 The NUNO Kasane textile is in a technique called tsugihagi (patchwork). It is made with various silk remnants of NUNO projects. 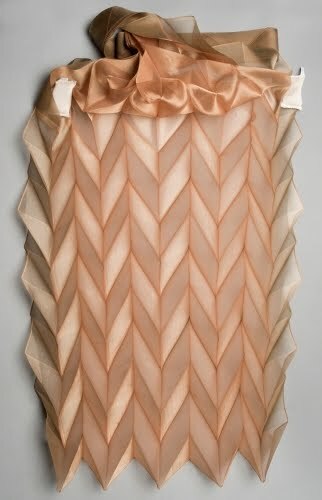 This technique uses the previously discarded outer layer of the silk cocoon that protects the finer silk inside. NUNO created a social network for retired silk weavers who hand-weave the kibiso textiles in northern Japan. What type of Balance? You Decide.